Learn why Robotics Process Automation (RPA) is a growing trend in software testing, and how it an be used to accelerate complete test automation. With VIP, high-performance bots perform the repetitive tasks that slow testers down, allowing them to focus on testing new and important functionality. 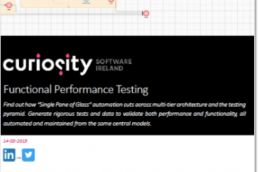 Meanwhile, the testing they perform is optimised for speed and quality, using a Model-Based approach to generate test cases, data, and automated tests. The result is rigorous testing that fits within the confines of a short iteration, and gets better the more you do it.